Description of "India's English Language Writing Guide"
Gary McKenzie-McHarg has worked in the education sector in Melbourne, Australia, in the following capacities: Managing Editor, Consultant, Workplace Trainer and Assessor, Instructional Designer, Researcher, Reviewer, Writer, Editor, and as a Project Manager for various interactive CD-ROM training projects. Past employers in Melbourne include RMIT University, Victoria University, TAFE Frontiers, Western Melbourne Institute of TAFE, Kangan Institute of TAFE, Gordon Institute of TAFE, Box Hill TAFE and, finally, the Australian and New Zealand Institute of Insurance and Finance (ANZIIF) as their Managing Editor. In 1997, Gary received the RMIT University Victorian Education and Training (VET) Institute Award for Leadership Initiative and Academic Excellence. In November 2007, he accompanied his wife, Sarita, to India so that she could pursue her Ph.D. in Indian classical music. He has since worked as Editor on various international education projects. The family currently resides at Ujjain in the state of Madhya Pradesh, India. 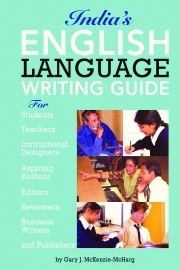 Reviews of "India's English Language Writing Guide"